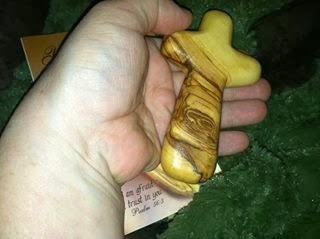 We are always looking for Christian-based gift products for our kids, and we received a My Cring Cross for review. "Caring Crosses are individually carved from a single unique piece of beautifully grained olive wood pruned from the olive trees around Bethlehem the birthplace of Jesus. Christians have been carving crosses like this for hundreds of years, originally for pilgrims and more recently tourists visiting the Holy Land. Each craftsman receives a fair price to support their family and Christian community. 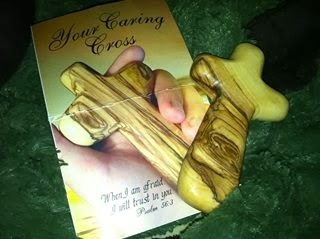 The Caring Cross is designed to fit comfortably into the palm of your hand as an aid to prayer or meditation." Our caring cross arrived in wonderful condition and I gifted it to my son. He loved the cross and started to carry it to school with him each day. We recently had several deaths in our family, and I am glad he had this cross to give him some comfort in our difficult time. The cross is very smooth to the touch and comes in a beautiful gift bag with information, making it a perfect gift for the holidays!